The second round of the National University League was played out yesterday at Oxford University, and the locals made every post a winner to head the league’s ladder after two completed rounds. The round featured the Universities Of South Wales teams for the first time, whilst the Birmingham University had the bye. Arch rivals, Cambridge University, had a grand day out to win both men’s and women’s matches and go to the top of the women’s division ladder. Oxford made it two wins from two on home soil to move to the top of the Men's Division. 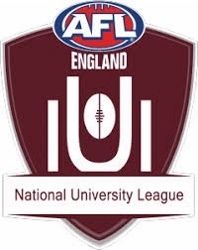 Cambridge got their first win of the NUL season as the Universities of South Wales made their debut in the competition. Meanwhile, Cambridge bounced back from losing both games last round, to win both today and move ahead of Oxford on percentage at the top of the Women's Division ladder. There was also a win for the Universities of South Wales in their first ever match! The next round is in Birmingham on January 19th. This week also saw four players from Birmingham University selected in the GB Bulldogs training squad. Congratulations go to Ciaran James, Sam Walon, Toby Webster and James Williams.